How much would you pay for the car of your dreams? Well, the official record for the highest price anyone ever paid for any car anywhere was just recently set when a 1961 Ferrari 250 GT short-wheelbase California got hammered down at auction for €7,040,000. Converted to 'merican dollars, that's about $10,976,000. That is a lot of money, there's no need for us to add any fancy exaggerative adjectives here. 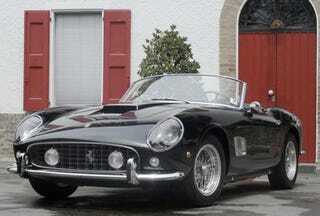 Le Mans-Winning 1962 Ferrari 330 Sells At Auction For Over $9 Million, Sets New Record Price!